The Navajo’s call this “The Top Of The World” where often times they come to pray. 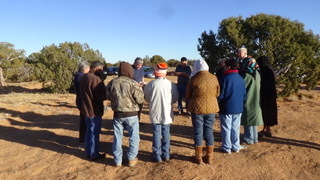 We joined pastor Stan and a few of his church members to pray for the community of Kaibeto. Recently Harry a good friend of ours lost his 26 year old son to suicide and Stan’s wife Maxine lost a nephew to alcoholism. Suicide and alcoholism is a big problem in Kaibeto and other Navajo communities. Please pray for Kaibeto, pastor Stan, his family and his church as they minister to the people in their community. Looking to get involved? Contact for volunteer opportunities and/or upcoming trips. You can also use either Donate button below to give towards the ministry.